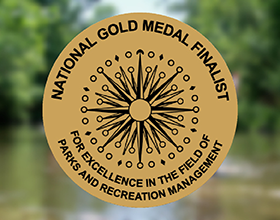 The American Academy for Park and Recreation Administration (AAPRA), in partnership with the National Recreation and Park Association (NRPA), recently announced the Centerville-Washington Park District as a finalist for the 2018 National Gold Medal Awards for Excellence in Park and Recreation Management. Founded in 1965, the Gold Medal Awards program honors communities in the U.S. that demonstrate excellence in parks and recreation through long-range planning, resource management, volunteerism, environmental stewardship, program development, professional development and agency recognition. Applications are separated into seven classes, with five classes based on population. The Centerville-Washington Park District is a finalist in the Class IV (population 30,001-75,000) category. Agencies are judged on their ability to address the needs of those they serve through the collective energies of community members and staff. The Centerville-Washington Park District joins three other finalists in their class that will compete for grand honors this year. This year’s finalists will compete for Grand Plaque Award honors this summer, and the six Grand Plaque recipients will be announced live during the General Session at the 2018 NRPA Annual Conference in Indianapolis, Indiana, Sept. 25–27, 2018.